“Nature is not a risk, it is an opportunity and can help to make our cities more liveable and resilient!”, stated Tri Rismaharini, the Mayor of Surabaya and recently elected President of UCLG ASPAC, when she opened the peer learning event on disaster risk reduction and the localization of the Sendai Framework. 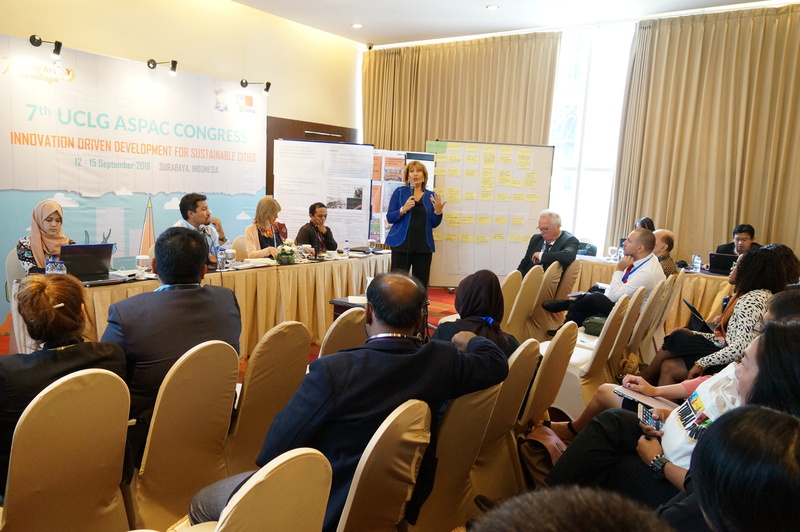 The peer learning session was embedded in the 7th UCLG ASPAC Congress and coordinated by UCLG Learning and UCLG ASPAC, in partnership with UN-Habitat, United Nations International Strategy for Disaster Reduction (UNISDR), Connective Cities and the UCLG Working Group on Territorial Prevention and Management of Crises. Local governments are front runners in the implementation and fostering of the Sendai Framework. For the localization of the Sendai Framework, the role and limits of local, regional and national governments must be understood and put into context, regulations should be efficient and flexible, and local government must be supported with training for proactive communities. UCLG has committed to support the implementation of the framework, in particular the formulation of local strategies that can be an opportunity for more resilience. Field visit to the disaster site of Sidoarjo. Keynote speeches by partners on context and instruments. Round tables to identify challenges and mandate members. Exchange and mutual learning on 14 practices. The field visit to Lapindo mudflow in the Sidoarjo District underlined local governments’ challenges in mitigating risk but also their capacity to respond effectively in case a disaster happens. In May 2006, the drillings of a gas company in the area triggered a blowout of hot water, gas, and steaming mud. As a direct consequence, roads, factories, and homes were swallowed by a tide of reeking muck and disappeared. Twenty lives were lost, nearly 40,000 people displaced and several villages destroyed. Furthermore, this mud volcano has not stopped discharging a torrent of hot mud from the ground and is changing the natural and cultural landscape. The field visit stressed not just how devastating such a disaster can be for local communities but also that community and local and regional governments’ efforts are easily overlooked by higher levels of government that react to the media and unrest. Therefore, local disaster risk reduction strategies need to involve all levels of governments. The mayors and practitioners confirmed these findings, they all subscribed to the resilience campaign and stressed their appreciation of the Sendai Framework on Disaster Risk Reduction (DRR). However, the perspective of United Nations frameworks and guidance on DRR and resilience that were presented by partners will need to focus more on local governments’ way of management and dealing with community. 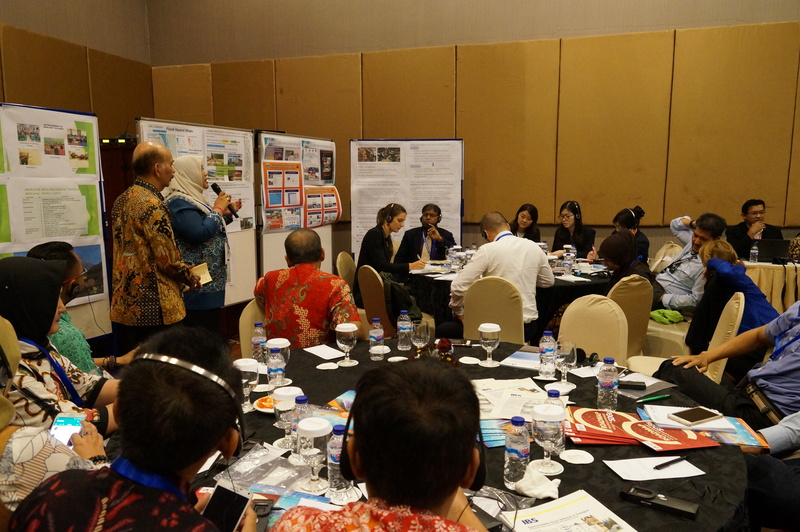 The mutual learning between the participants outlined the variety of existing good local practices to reduce risks. The Mayor of the city of Iriga joined via conference call while dealing with a typhoon hitting the city. She highlighted the importance of local governments to be prepared and to have strategies in place in order to protect their cities. Inspired by her intervention, the city of Albay presented their “zero casualties” strategy, which increased the city’s resilience significantly. The experience of Christchurch with community‑based disaster risk reduction and Tokyo’s self-critical know-how in post-crises management also enriched the learning exchange. The German experience of the cities of Cologne and Bochum that were invited by the GIZ programme Connective cities presented their clear analysis of cost benefits and integrated disaster strategies that keep administrations and communities permanently involved. The Vice-Mayor of Bochum, Kopietz, stated: “Disaster is not a deal of one department, it is a deal of well-functioning teamwork in exceptional situations”. The findings will be documented in the peer learning note to be published soon, which will provide an outlook on how UCLG can undertake stronger action in the localization process of the Sendai Framework. Visit the dedicated website of the 7th UCLG ASPAC Congress. Visit the website of UCLG Learning.